CNN's John Avlon discusses the significance of the investigation into President Donald Trump's inaugural committee. This week, we learned that the Southern District of New York -- my former office -- dropped an incendiary subpoena on President Donald Trump's inaugural committee seeking evidence of mail fraud, wire fraud, money laundering, conspiracy and illegal foreign contributions, and has requested interviews with Trump Organization executives. This is particularly bad news for Trump because, in many respects, the SDNY poses an even more potent threat than special counsel Robert Mueller. As accomplished and respected as Mueller is, the SDNY has important structural advantages. While Mueller is limited by his appointment to investigating coordination between Russia and the Trump campaign (and matters that "arise directly" from such coordination), the SDNY has no substantive constraints and can go wherever the evidence leads. Mueller faces political pressure from Trump and the Department of Justice to finish his investigation; the SDNY isn't going anywhere and can take whatever time it needs. The SDNY is also not subject to the special counsel regulations, which require attorney general approval for major prosecutorial decisions and through which Mueller ultimately must filter his findings. And, unlike Mueller, the SDNY cannot be fired or defunded; sure, Trump could fire the US attorney for the SDNY, but there will still be 150-plus apolitical career prosecutors ready to carry on. Take it from an alum, the SDNY is uniquely tenacious and relentless. In other news, Roger Stone sent mixed signals about whether he might cooperate with Mueller. Trump -- perhaps spooked at the possibility of Stone flipping -- conspicuously declined to rule out a presidential pardon. And a federal judge is mulling whether to place a gag order on Stone, which could end a bizarre pretrial media blitz complete with Nixonian gesticulation, boastful social media posts and surreal press conferences. 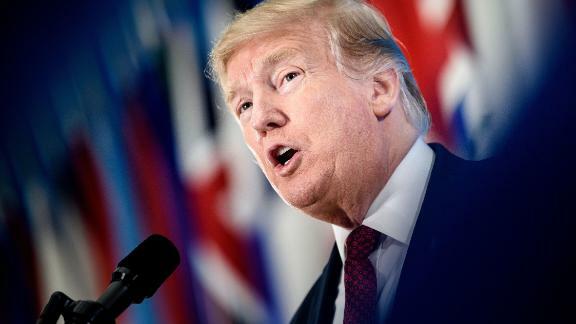 Trump told CBS News that the decision to release Mueller's report would be "up to the attorney general" before contradicting himself in the next breath, stating, "I don't know. It depends. I have no idea what it's going to say." This as Trump's attorney general nominee William Barr is up for a Senate Judiciary Committee vote, with questions lingering about whether and how he intends to release Mueller's report to Congress and the public. Finally, in his State of the Union address, Trump decried "ridiculous partisan investigations" as the enemy of economic growth. Trump's ultimatum -- stop investigating me, or else the economy will suffer -- might rally base political support, but it will not deter Mueller, the SDNY or House Democrats. Similarly, Trump bizarrely declared, "If there is going to be peace and legislation, there cannot be war and investigation." While peace and war certainly are opposites that by definition cannot coexist, legislation has nothing whatsoever to do with investigation, beyond sort-of rhyming. Roger: Doesn't the fact that Mueller requested and got an extension of the grand jury suggest that more indictments may be on the way? Why extend the grand jury if the investigation is "close to being completed"? Federal grand juries are initially appointed for finite periods of up to 18 months. If that time is about to run out, but the prosecutor needs to continue an investigation, he or she can move a judge to extend the grand jury by up to six more months at a time. Mueller's grand jury originally was empaneled for 18 months and, in January 2019, a federal judge granted Mueller's request to extend it up to six more months. Mueller may not use that entire time, but six months is the maximum extension Mueller could have requested, and he could have -- but did not -- ask for a shorter extension. All told, the grand jury extension is one of many indicators that acting Attorney General Matthew Whitaker's statement that Mueller is "close to being completed" does not mean everything will slam to a halt by Valentine's Day. Other indicators include: newly filed charges against Stone; ongoing cooperation from Michael Flynn and Rick Gates; unresolved sentencings of Flynn, Gates and Paul Manafort; recently executed search warrants on Stone's homes, which yielded voluminous potential evidence; the ongoing mystery subpoena battle in the Supreme Court; a potential subpoena on Trump; various congressional investigations into Russian collusion and Trump's finances (which Trump called "presidential harassment"); the Mueller report with its attendant legal and political battles; and ongoing investigations by the SDNY -- to name a few. Toby: With Stone's record for lying, why would Mueller bother to even make him an offer? I've made cases based on testimony from some of the worst people on Earth -- mobsters, murderers, drug traffickers, you name it. I'm not saying Stone is worse than a murderer, but he could be more problematic as a cooperating witness. The question with cooperators is not whether they are likable (usually not) or good people (usually not). The question is whether they are credible. Stone, perhaps more than any cooperator I've dealt with, has based his identity on dishonesty. His mantra is "admit nothing, deny everything, launch counterattack," and he proudly calls himself a "dirty trickster." Now Stone has been indicted for false statements, obstruction and witness tampering -- all crimes of dishonesty. That said, I'd still try to flip Stone. The potential reward is enormous: Stone could identify the "senior Trump campaign officials" who directed him to coordinate with WikiLeaks (or at least confirm their identities, assuming Mueller already knows). He also likely can specify what communications he or others had with WikiLeaks to help the campaign. All told, Stone remains unlikely to cooperate, but I've seen stranger things happen. Remember, ex-Trump lawyer Michael Cohen vowed that he would "take a bullet" for Trump before he cooperated; heck, virtually everybody has cooperated with Mueller, or tried to (Cohen, Manafort, Gates, Flynn, George Papadopoulos). I've flipped mobsters who swore a blood oath never to cooperate and who have actually killed cooperators during their Mafia careers. If they can flip, so can Stone. And if he does -- then everything could change. Neroli: Won't Stone have to confess all past crimes to cooperate? This raises an important distinction between my former office, the Southern District of New York, and other prosecutors. The SDNY requires a cooperator to admit everything he has ever done or known about, without limitation. Many other prosecutors, however, will sign up a defendant as a cooperator if he satisfactorily answers certain limited questions. Take Cohen, for example. In its sentencing memo, the SDNY blasted Cohen because he "repeatedly declined to provide full information about the scope of any additional criminal conduct in which he engaged or had knowledge." Mueller, on the other hand, submitted a more positive memo and voiced no objection to Cohen's efforts to limit the scope of his cooperation. Given that Mueller's team appears to be running the Stone prosecution (along with attorneys from the District of Columbia US Attorney's Office), I'd suspect Stone might not have to spill all in order to cooperate. For the record: I believe in the SDNY method. A prosecutor needs to be able to present a cooperator to a jury as an open book who has confessed everything he has ever done. Robert: Must a presidential pardon be specific to a particular instance of crime, or can it be used as an umbrella against any and all future related charges that are not yet filed? The constitutional pardon power is remarkably broad. A president can pardon either an individual (Richard Nixon, most famously) or a group (Vietnam draft dodgers and Confederate soldiers, for example). A president can pardon for specific crimes or in blanket fashion. For example, President Gerald Ford gave Nixon a blanket pardon for any acts committed while Nixon was President, without specifying any particular crime. There is one key limitation on the pardon power: A president cannot grant a pardon for future conduct that may occur after the pardon is issued. The constitutional pardon power is extensive, but it is entirely backward-looking and does not allow blank checks for future crimes. Mike: How does this [report that the blocked phone number Donald Trump Jr. called before the June 2016 Trump Tower meeting was not his father's phone] exonerate him? It doesn't exonerate anybody, despite Trump's effort to spin the story into proof that the June 2016 Trump Tower meeting was "innocent." This happens all the time: Investigators see something that might be relevant, or might not, and then run it down. That's what an investigation is all about -- pursuing leads and determining what is and is not true and relevant. Now we know those calls from Trump Jr. did not to go to President Trump. That does not end the inquiry, however. First, President Trump was inside Trump Tower on the day of the meeting, so he and Trump Jr. certainly could have communicated in person. Second, we know that Trump helped draft -- his own lawyers said he "dictated" -- the false post-meeting public statement claiming the meeting was primarily about adoptions. And third, the meeting remains legally problematic for Trump Jr. and Jared Kushner (and Trump if he knew about it) because it is a federal crime (1) to solicit election aid from foreign nationals and (2) if Trump Jr. lied about the meeting to Congress. This part of the story is far from over, and nobody has been declared innocent. Elvis: The Senate has decided to subpoena Cohen, in spite of his allegations of threats to his family. What are the responsibilities of a body, forcing someone to come forward via subpoenas, toward the protection of that person and their families? When federal prosecutors subpoena somebody or enlist that person as a cooperator, the US Marshals take responsibility for protecting the person and his family. The movies call this the "witness protection program," and in real life it is known as the Witness Security Program or "WitSec." The marshals do a remarkable job; they proudly claim that no WitSec participant has ever been killed while in the program and following program rules. I've dealt with many cooperators in WitSec, and it actually is like the movies. I've spent days with former New York mobsters who have been given new identities and relocated to a faraway state; it's the classic fish-out-of-water story come true. Congress does not have its own WitSec program, but I suspect that if the need arose, Congress would request that the marshals take an important witness who faced danger into WitSec, and that the marshals would agree to handle it. Eddie: What would happen if Cohen refuses to testify despite the subpoena? Short answer: Congress could pursue contempt charges, which might land him in prison (or, in Cohen's case, extend his prison time) -- but only if Congress referred the contempt case to DOJ for prosecution or pursued an obscure civil action on its own. Longer answer: See this fascinating New York Times explainer from Harry Litman. (Did you know Congress still has its own antiquated prison cell? Seems almost charming). 1) With Cohen's closed-door testimony in the House postponed until February 28 "in the interests of the investigation," should we expect more indictments from Mueller between now and then? 2) In his congressional testimony on February 8, how will Whitaker defend and explain his statement that Mueller is "close to being completed"? 3) Will Judge Amy Berman Jackson issue a gag order against Stone, depriving the country of what promises to be an absurd and entertaining pretrial circus?